Grand Lake O’ the Cherokees is a large reservoir in northeast Oklahoma, below the confluence of the Neosho and Spring Rivers, both of which drain the Tri-State Mining District to the north. The Tri-State district covers an area of 1,200 mi2 (3,100 km2) and comprises Mississippi Valley-type lead-zinc deposits. A result of 120 years of mining activity is an estimated 75 million tons of processed mine tailings (chat) remaining in the district. Concerns of sediment quality and the possibility of human exposure to cadmium and lead through eating fish have led to several studies of the sediments in the Tri-State district. In order to record the transport and deposition of metals from the Tri-State district by the Spring and Neosho Rivers into Grand Lake O’ the Cherokees, the U.S. Geological Survey collected 11 sediment cores and 15 bottom-sediment samples in September 2007. Subsamples from five selected cores and the bottom-sediment samples were analyzed for major and trace elements and forms of carbon. The sediment samples collected from the sediment-water interface had larger average concentrations of zinc, cadmium, and lead than local background. The core collected from the Spring River had the largest concentrations of mining-related elements. A core collected just south of Twin Bridges State Park, at the confluence of the Spring and Neosho Rivers, showed a mixing zone with more mining-related elements coming from the Spring River side. The element zinc showed the most definitive patterns in graphs depicting concentration-versus-depth profiles. A core collected from the main body of the reservoir showed affected sediment down to a depth of 85 cm (33 in). This core and two others appear to have penetrated to below mining-affected sediment. Contains the tables of analytical data in Excel format. 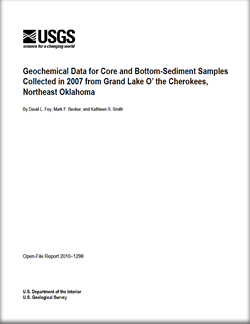 Fey, D.L., Becker, M.F., and Smith, K.S., Geochemical data for core and bottom-sediment samples collected in 2007 from Grand Lake O’ the Cherokees, northeast Oklahoma: U.S. Geological Survey Open-File Report 2010–1298, 70 p.